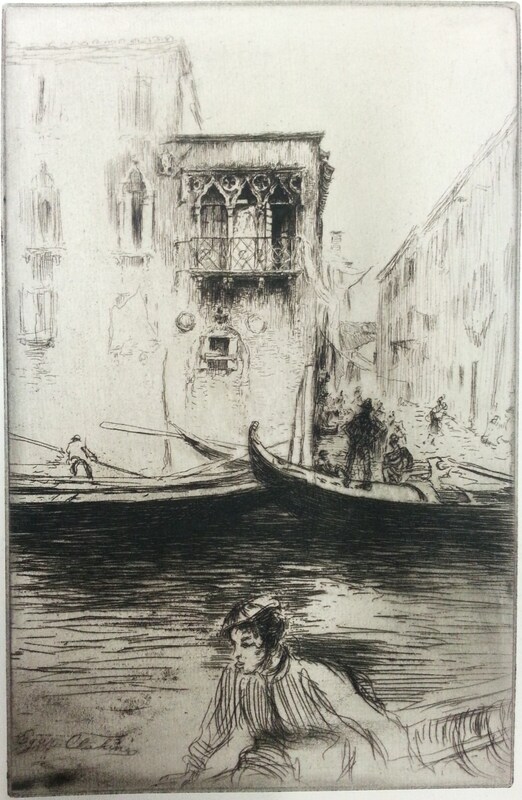 Title: "Rio Ca Foscari, Venice"
Edgar Chahine was born in Vienna but moved to Constantinople at a very young age. There he began his studies under the financial support of his father who was the director of the Ottoman Bank. His artistic abilities were soon noticed by his professor, Melkon Tiratzuyan, who advised him to pursue his studies in Italy in order to participate in a more active artistic environment. He then moved to Venice, Italy where he attended the prestigious Armenian Lyceum Mourad Rafealian on the San Lazzaro Island. He studied under Antonio Ermolao Paoletti at the renowned Academia di Belle Arti. After gaining much experience in Italy, he then moved to Paris in 1895. He enrolled at the Académie Julian, and had successful exhibitions at the Society of French Artists. His first painting which was exhibited at the Paris Salon “Societe Des Artist Francais” in 1896, was a portrait of a beggar. He continued to have exhibitions from 1896 to 1899. In these exhibitions, Chahine included his art series called "Lamentable Life" which features the tables of poor people. In 1900, his prints earned him a gold medal at the Universal Exhibition in Paris. In 1903, he won another gold medal at the Venice Biennale. Chahine often turned to Armenian themes and in 1926 was a founding member of “Ani”, the Union of French-Armenian Artists of Paris. He became a naturalized French citizen in 1925 and was awarded the Légion d'Honneur in 1932. Unfortunately, Edgar Chahine's artistic career took an unexpected turn when many of his prints were lost in a fire in his atelier in 1926, and many more were destroyed in a flood in 1942. Due to these unfortunate events, much of his paintings and prints are yet to be seen or discovered.